If you like uniqueness with luxury and convenience then it's time to take it up a notch in this Montana High Country fifth wheel. Model 374FL offers a patent-pending front windshield design and unique dual entry, one main entrance along the awning side and one entry across from the bathroom on the opposite side of the fifth wheel. 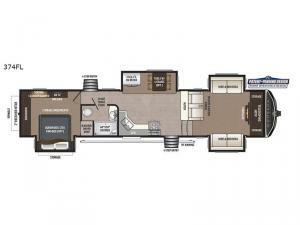 You will enjoy great traffic patterns from this floorplan design. The front living area offers plenty of seating choices plus a HD LED TV above a remote controlled electric fireplace to keep you warm during the chilly nights. The rear bedroom allows you to relax and rest on a queen bed with a shiplap design headboard, and watch a 32" HD LED TV before bedtime. You might even choose to add a washer/dryer option so you can clean your clothes while away from home. There is bench seating and a hamper you will also appreciate. Check this unit out today!